Many of the techniques will use hands-on mediums, such as ink and charcoal on paper, clay, paper cut-out, collage, and more to create the elements of narrative in animations. You’ll also become familiarized with Dragonframe and Adobe After Effects applications, DSLR cameras, and tech used in stop motion and film. Audio 1 is an introductory course focusing on the basics of capturing, processing, and manipulating sound and how it is used in creative storytelling. You’ll explore the science of how sound is created and perceived in nature. Technical exercises include using field recorders to capture sounds and editing audio with Pro Tools. During the first semester, you will get an overview of film history, beginning at the origins of animation all the way up to contemporary animations worldwide. In the second semester, you’ll be introduced to the first films ever made, French Avant-Garde, Soviet Montage, German Expressionism, Surrealism, and the rise of the Hollywood Studio System. The ability to construct a story is an essential aspect of all filmmaking. Introduction to Storytelling will explore the traditional elements of story as they have developed over history and examine the traditional structures used to convey such stories to an audience. The class has a lecture and a writing lab component where you’ll construct original stories that pastiche the structures learned in class. The screenplay is the basic blueprint for all visual storytelling productions. In Introduction to Screenwriting, you will “break” scripts and analyze the constituent elements of composition. You’ll read screenplays, understand the conventions of genre, and to evaluate the choices a writer, director, or editor have made in order to communicate to an audience an intended effect. Photography is a foundational course designed to teach students the fundamentals of framing and composition. You will gain the technical skills to comfortably and confidently operate the camera. This course will explore the many ways to employ photography creatively through understanding of framing, composition, lighting and exposure. You will be introduced to basic film equipment, the principles of working in a crew, moving frame composition, technical vocabulary, and cinematic storytelling. You’ll learn basic pre-production, production, and post-production skills. In the last quarter of this semester-long class, students will be trained in the fundamentals of acting. This is a hands-on class dedicated to students working on a project, mostly, but not limited to animation. Skills and techniques learned in all art classes will be applied to the progress and completion of a project or production. This class time is also used for visiting artists, industry professionals, and guest lecturers sharing their insights and experiences with you. You will acquire the necessary skills to render figures and spaces sufficient for storyboard illustrations. You’ll also learn about the different industry storyboard types and understand storyboarding’s place as a visual tool in film production. This course is fundamental to the preproduction aspect of filmmaking. This year-long course is a continuation of the freshmen Audio for Filmmakers I course, with advanced audio recording techniques and audio editing. You’ll explore audio recording on location and studio, sound design, ADR, and foley. This yearlong cinematography course builds upon the compositional skills and concepts introduced with the 9th grade animation course. Visual thinking continues to develop through the challenges of real world cinematic problem solving. 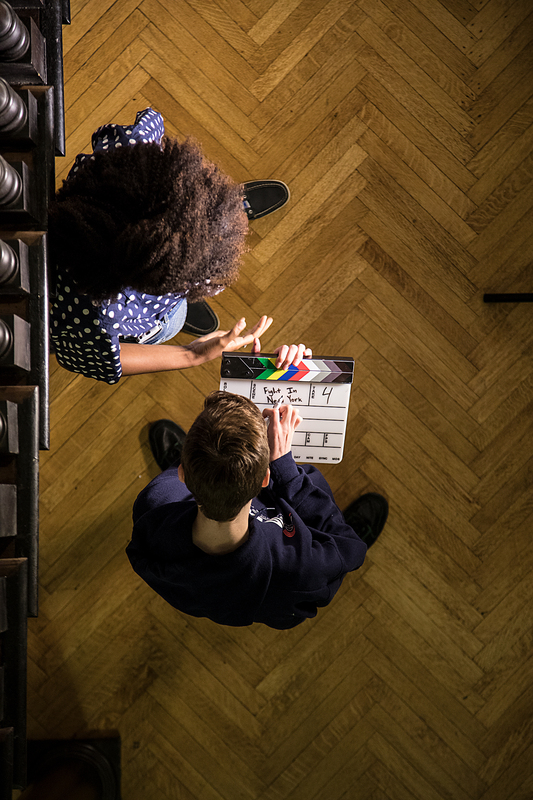 You will explore the roles of the motion picture camera department to gain familiarity with camera equipment, on set etiquette, responsibilities and hands on experience shooting and managing their own media. Additionally, you will learn techniques specific to the areas of cinematography, camera operation, lighting, and media management. In this course, you will explore the relationship between a viewer and the experience of a story. By learning the history and fundamentals of programming, computer science, game engines, and immersive experience design, you will form a deep understanding of emerging platforms such as virtual and augmented reality, interactive narratives, and non-linear story telling. Additionally, you will learn the fundamentals of programming, computer science, and the Unity game engine, in order to produce their own immersive experiences. This yearlong course will introduce students to the editing process and the editing software Adobe Premiere Pro, as well as Adobe After Effects. This course is project based, and you are expected to complete four projects. Basic and advanced editing skills are introduced, along with a fundamental understanding of the art of visual story construction and the technical and artistic aspect of editing. You will develop the cinematic language through hands-on practice, scene analysis, and the exposure of various editing styles. This year-long course will survey film movements and critical approaches in American and International film from 1945 to present. The course will emphasize the historical and cultural aspects of the movements and films, and gives an understanding of a film’s visual and narrative structure.